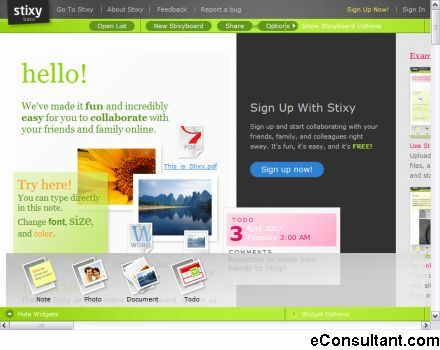 Description : Stixy helps users organize their world on flexible, shareable Web-based bulletin boards called Stixyboards. Unlike most personal productivity or project management software, Stixy doesn’t dictate how users should organize their information. Users can create tasks, appointments, files, photos, notes, and bookmarks on their Stixyboards, organized in whatever way makes sense to them. Then they can share Stixyboards with friends, family, and colleagues.